The word alambre means wire in Spanish. When you think of wires, the food has to be skewed. For Mexican, the food does not come off the skewer. The word 'al' has some Arabic origin influencing this dish. In Mexico city, a typical alambre is made of green peppers, onions, meat and sometimes bacon. 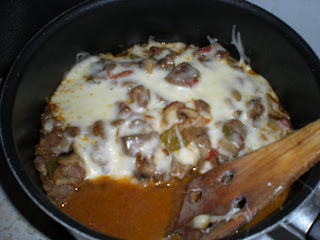 This is a wonderful dish from my Mexican friend and would like to cook it for my family. 1. 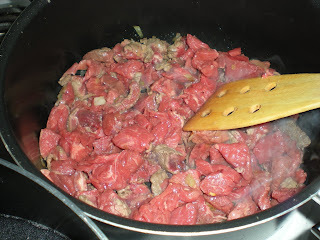 Cut stew beef into smaller pieces. Cut tomatoes, onions, green pepper into cubes. Thinly slice mushrooms. 2. Heat oil in a large pot over medium-high heat. Add garlic and onions, cook until transparent. 3. 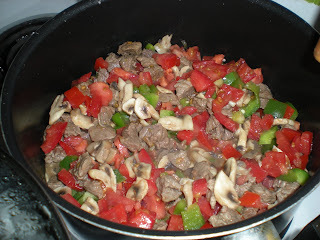 Add beef and bacon, cook until browned. 5. Turn off heat and top with mozzarella. Let it melt for 1-2 minutes. 6. 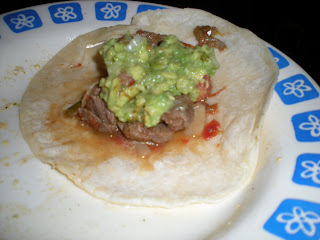 Serve on tacos or tortillas and top with guacamole. This dish looks really good. Good job!